Built in 1897, originally a library, the grade II listed building became an arts centre in the 1960s. 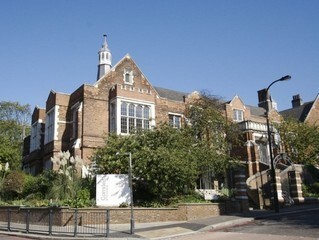 Following a reburbishment by Tony Fretton Architects, Camden Arts Centre re-opened to the public in 2004. The beautiful and sensitively designed building combines the original victorian gothic features with a contemporary urban design to enhance space and light. The new galleries attract artists of the highest calibre, able to display a broad range of work including installation, film and video, light sensitive drawings and sculpture. Local parking other than for blue badge holders is very restricted except on Sundays. Paid parking is available at the O2 Centre (400 metres).